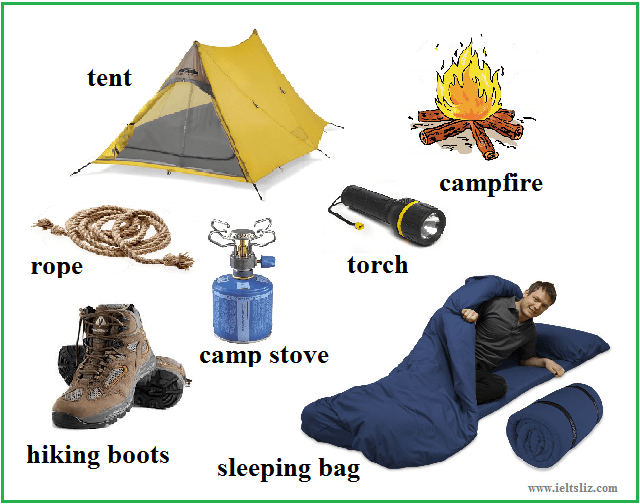 Camping is a topic which can appear in IELTS speaking part 1. Learn some useful words to be able to talk about this topic. Listen to the recordings to improve your pronunciation. Listen to the recording below to improve your pronunciation. I really appreciate your simple and in detail guidance for self learners but I didn’t find any page for writing task 1 for GT candidates on your website. Could you help me for this! Please go back to the main writing task 1 page and look for the Essential Letter Writing Tips link which is further down the page. I am highly grateful to You, for your well published topics on IELTS. is there any difference while we refer to Floor Location in American English & British English? Is Ground Floor in American English = First Floor in British English true? It’s the opposite way round. Ground floor is in the UK which is First floor in the US. Fee month ago I joined a institute where teachers everyday changed & they teach different different way or method where I was really confused & now leave that institute.i didn’t join any where . Get a free practice test and do it at home. Make a list of all the aspects of the test that confuse you. Also make a list of all the question types in each part of the test – review and practice each type. That will give you a very clear understanding of IELTS. You can access the main pages of my site through the red bar at the top of my website. yes i made a list of different type of questions where i am confused. among them identification of heading and true or false or not given in reading module confusing me a lot. please help me to get ride off the problems because i have only problem with reading module. Can I use British slang language in speaking test or not ? The speaking test is informal so you can use informal language but you must always be polite. Hi Liz,thank you for your wonderful teaching.ln speaking is it ok to call the examiner as madam or sir. No. Using “sir” or “madam” is incorrect use of English. Hi Liz..If it is not okay to use Sir or Madam then how should we address the examiner? Please tell..
You use normal language. For example: “Can you repeat that please?” There is no title given. You just use the informal “you” without a title. It will not alter your score at all. Particularly, when your compliments show mistakes in English or are learned phrases which are not appropriate for the situation. I’m thankful to you for guiding me through..I’m trying to go through all your work although I do not have time to like or comment each topic. Do we need to get western examples or using our own eastern examples is fine. Which we can we score high marks? My favourite movie, favourite novel or person..etc. The examiner is not interested in your ideas for speaking. All the examiner wants is to hear your English. So, you can give any ideas you want and have any views you want. Just relax and be natural and chatty. As for Asians, our accent is not like we hear in this. Is that a problem? You don’t need to change your accent. As long as your English is clear and your accent doesn’t cause problems with pronunciation. Thanks alot Liz for your vocabularies. Hi Liz,really this is the first time I keep my eyes skinned on what one of the IELTS teachers post.Anyhow,your work is very distinguished so well done and I do believe that yours lessons would be of benefit ,that is to say ,keep it up and I`m so eager to read more and watch more videos .Best of luck and warm regards. Liz a question is can we write both in pencil and pen. Like for example we write the listening section with pencil and writing section with pen. Secondly, which you suggest is a good instrument for the writing in the ielts exam and reasons for the same. you simply are the best Liz..!! This first time I wrote to you and I would like to thank you a lot for your helping hand, I want to inform you I have just start following your lessons to get good score in ielts exam but the main aim for me is improvement my self than to get result in the certificate. Firstly, may I thank you so much and be sure that we owe you too much for all your helping hand and efforts. Actually, it would be much appreciated if you explain more and post tips about the reading technics (I mean the best way to answer the questions of reading section). Really have no words for you usual support!!! Wonderful Liz, You are doing what others abhore and that is training us for free. Thanks. Please can one go in with his table clock, considering that the whole exam is about time management. Unfortunately, you can’t even take in a wrist watch. You can only take pen, pencil and eraser. There is a clock on the examination wall which you need to keep checking. I salute you for your these rewarding work for us who are in need of good band score in IELTS, please keep it up, may God bless you. firstly, may I ask thank you for your helping hand to us to climb this mountain I mean learning English. actually I just want to ask you how can we get some of the essays to improve our skills in the writing side. and please if you can make your list of vocabularies as PDF to get them easily. finally, make sure that we owe you. Here’s a link to my writing task 2 page for essays: http://ieltsliz.com/ielts-writing-task-2/. I aim to put more lessons into PDF form but it will take time.